Conveniently located in San Carlos de Bariloche, 7 De Febrero Hotel is a great base from which to explore this vibrant city. From here, guests can enjoy easy access to all that the lively city has to offer. With its convenient location, the hotel offers easy access to the city's must-see destinations.The facilities and services provided by 7 De Febrero Hotel ensure a pleasant stay for guests. The hotel provides tours, laundry service/dry cleaning, 24hr room service, elevator, bar/pub to ensure our guests the greatest comfort. Experience high quality room facilities, including shower, bathtub, satellite/cable TV, non smoking rooms, television, to help you recharge after a long day. Besides, the hotel's host of recreational offerings ensures you have plenty to do during your stay. 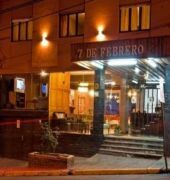 7 De Febrero Hotel is your one-stop destination for quality hotel accommodations in San Carlos de Bariloche.